Whether you’re a first-time home buyer or you’ve purchased several homes over the years, this process can be stressful. Saving up for your down payment. Searching for the right property. And, once you find “the one”, packing up to move. Technically, that house isn’t your home until the final papers are signed and you’re handed the keys. In between an acceptance of your offer and the final key trade-off lies a lag time for paperwork processing. 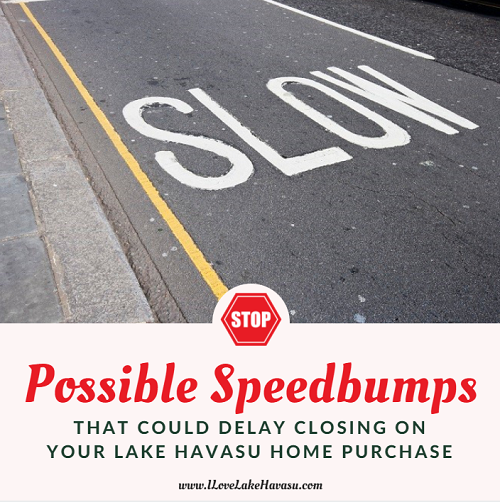 In that time, you may face possible speed bumps that stall closing on your Lake Havasu home purchase. But, most of these are avoidable. The first tip I always give to my buyers is to avoid any big purchases while waiting for your Lake Havasu home purchase to close. Save the decorating until after moving day. New furniture, flooring, paint, etc must wait until you actually own the home. Also, avoid buying or leasing a new vehicle. Your mortgage company pulls your credit one more time before final approval. Big changes throw up red flags. In turn, your approval could turn into a rejection. Sometimes, employers, landlords, banks, and mortgage companies may take a little longer to verify information. Other times, the mortgage company may need additional info. If you are using funds from something other than your savings to provide your down payment (borrowing from family, crowdsourcing, a gift from grandma, etc. ), it might take a little more time to verify the source. And, sometimes, the lender may require you to come up with a little more money for your down payment before they approve you. Self-employed buyers or those with multiple sources of income may also require additional paperwork to be completed. A low appraisal of the Lake Havasu home in question creates a delay. Buyers need to either come up with more cash to bridge the disparity gap or negotiate a lower sale price. Also, there’s insurance to contend with. If you’ve had problems in the past with your homeowner’s insurance, it may be difficult to be approved for insurance on your new home. And, if your new home is located within a flood zone, you’ll need flood insurance as well. Yes, even in the desert, some Lake Havasu homes lie within a FEMA flood zone. With today’s busy lifestyles, scheduling both parties to sign paperwork on closing day can be difficult. This is especially true when either party lives out of town. And finally, the seller may not agree to all requests a buyer makes in their contract (certain upgrades, repairs, including furniture in the final sale price, etc.). Until both parties agree on the final contract, the Lake Havasu home purchase remains in limbo. Some of the delays buyers encounter during their Lake Havasu home closing have absolutely nothing to do with them. For example, HOA problems. If the current owner is behind on their payments or owes fines, these need to be hammered out with the seller before close. Also, tax liens must be taken care of before ownership changes hands. Otherwise, you (the new owner) may have to pay the old owner’s liens. Likewise, some lenders may require some property damage be repaired before closing, even if the buyer is fine with buying it “as is”. If you’re buying a property in foreclosure, this could also present a delay of as many as 10 days to find out the final payoff from the current homeowner’s mortgage company. Finally, while not common, the homeowner may die during the closing process. When this happens, the home in question could go into probate, causing a delay in finalizing the loan. Unfortunately, all you can do is wait until the legal proceedings are complete. What issues have you come across when buying a Lake Havasu home in the past? How did you resolve these issues? Please feel free to share your experiences in the comments below. I think we could all benefit from some real-life examples. When you’re ready to make your next Lake Havasu home purchase, please contact me.